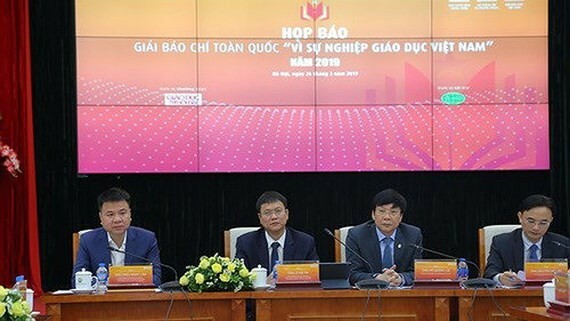 A press brief on the National Press Award on Education was held by Deputy Minister of Education and Training Le Hai An and Deputy Chairman of the Vietnam Press Association Pham Quang Loi yesterday. Deputy Minister Le Hai An stressed for past years, the media has accompanied with education sector during renovation period as per the government’s curricular No. 29/NQ-TƯ and helped brought forth policies and changes in education and training sector to the public. Accordingly, the award targets to honor individual reporters and groups of reporters that have written good articles on education. 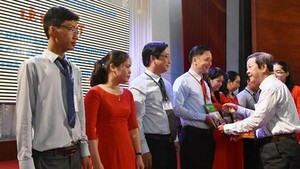 Entries should be Vietnamese articles which have been published in newspapers from September 5, 2018 to September 5, 2019. Entries may be journal articles, interviews, reports, observations, diaries, programs on printed newspaper, online newspaper, radio, television. Entrants have written about typical on-going teaching and learning activities in localities or in educational facilities including preschools to higher education; individuals or groups that made outstanding accomplishment in teaching and learning as per the central committee’s circular No. 29-NQ/TU in 2013 on comprehensive educational and training reform to meet industrialization and modernization in governing the market economy with socialist orientation and world integration. Moreover, entrants should write about true moving stories of real teachers and their deeds to inspire society. Winners who are given the First Prize will receive cash of VND30,000, 000 ($1,292); Second Prize- VND15,000,000; Third Prize- VND10,000,000 and Encouragement Prize- VND5,000,000. The best character in the winning articles will be given cash or gifts worth VND5 million. The press works should be sent to the Ministry of Education and Training and the Giao Duc va Thoi Dai (Education and Time) newspaper no later than September, 2019. The organizer had given 43 awards out of nearly 700 entries in the last year award.